Just Jingle: Vintage Post Card Images Make Me Happy. Just say'n. Vintage Post Card Images Make Me Happy. Just say'n. I don't know what it is about the thing like old stamps, post cards, letters, and the like, but quite frankly...I love 'em. 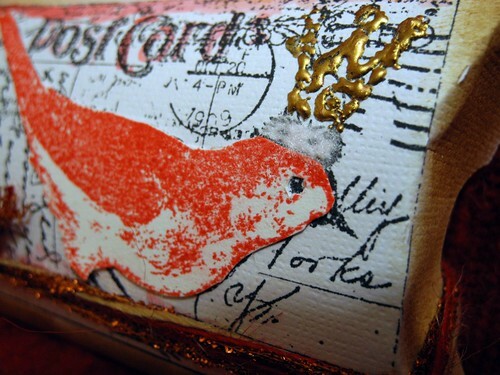 And that, my friends, is pretty much why I LOVE this Bird Post stamp from Stampendous! It comes in cling or wood mounted, too, which is nice! To create my pillow box, I first cut the box from the Art Philosophy Cricut Cartridge from white cardstock. Keeping it flat, I stamped the image in black directly on the box. Then I stamped the image a second time, this time with red ink, on another piece of white cardstock and I cut out the bird to mount over the one in black. I inked around the edges with distress ink, leaving the card white. I added a bit of a watercolor touch with my waterpen and a red ink pad and then I added some aged gold embossing enamel to the crown and Fun Flock in Cotton Ball, as well. I assembled the box ('cause I heard they work better that way) and then tied it up with pretty May Arts twine! And NOW...I just need to go buy something small enough to fit in it to give to someone! HA! 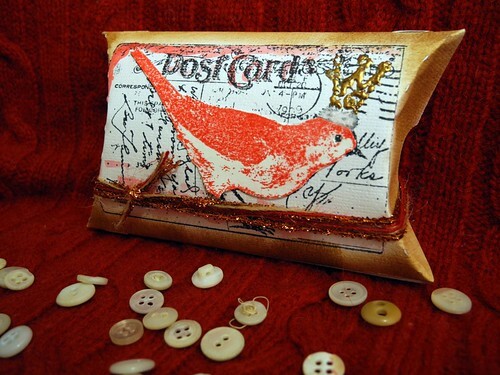 Actually, these are great for gift cards! They also look really pretty peaking out of a stocking OR...you can fill them with candy. 'Cause candy makes people happy. At least...it makes me happy and that's all that matters, right? HA! TOTALLY kidding. Well, not about the candy making me happy part. Just say'n. wow this is just too cool...I love how you embossed the crown...what a fun idea..
Great card...Candy monster..LOL!!! I think your secret is out sweetie on how much you like sweets. ihave this stamp and love it. love how you did it. this is a stamp i'll reach for again and again. Love how this came out~so vintage loooking!!!! This is my first visit to your site. I can tell just by your photo that you a girl after my own heart!! Your box looks great. O.k. now to read older posts and catch up!!!! ooo - you know who to give this one once you fill it with candy!! (me of course if I HAVE to spell it out) just say'n ;) You're an inspiration! Super cute! Love that little box. 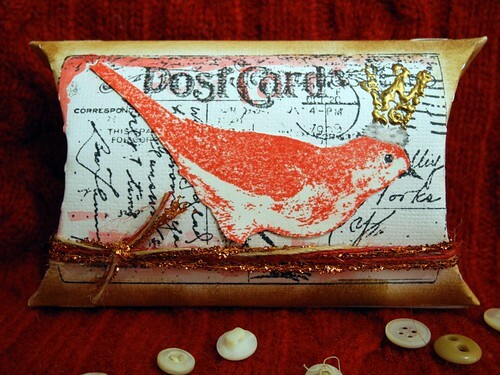 Bird stamp is gorgey! 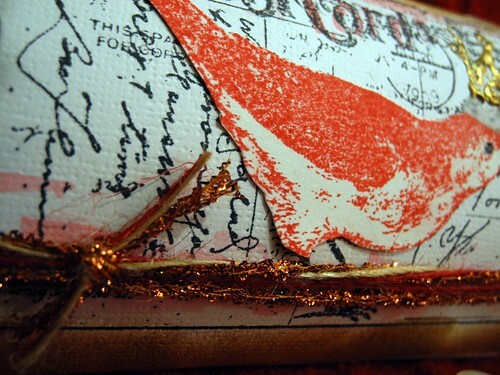 love your pillow box and that stamp is fabulous, love it! I think I have a pillow box in my Silhouette library...gotta go check that out....LOVE yours! I have a little brown box like this one--thanks for the inspiration! Love your crowned bird and all that fab text on the postcard behind her. Have a great weekend! This is simply awesome!!!! I love that bird image so very much. What a great little gift this would make!